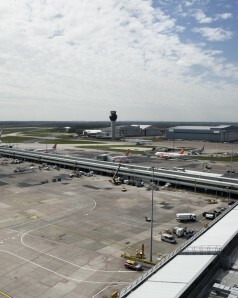 East Midlands Airport is one of the best connected business locations in the Midlands. It is already enjoyed by hundreds of staff who work for customers that include Regus, Price Waterhouse Coopers, Eon and UPS. Centrally located in the UK, the airport provides direct and immediate access to the UK’s key motorway, the M1. Junction 24 is less than two miles away, linked to the Airport by the A453, the majority of which is dual carriageway. location for air passenger, cargo, rail and road transport and a range of supporting economic activities. EMEG’s strong economic growth has been driven by investment of household names and their commitment to base themselves on-site. Along with the Airport, DHL, Marks and Spencer and Donington Park have all invested in EMEG. The East Midlands Gateway Strategic Rail Freight Interchange is also part of EMEG and is currently under construction in the area immediately to the north of the Airport. Its completion will deliver 6m sq ft of rail-served logistics space. Ultimately the East Midlands Enterprise Gateway will generate 14,000 on-site jobs. EMEG is recognised as a key growth area in both of the region’s Local Enterprise Partnership’s economic plans. advantage of the economic growth, productivity and skills opportunities we face as a nation. In addition to this there are two Local Enterprise Partnerships in the East Midlands, with East Midlands Airport located at the heart of both of them – the Leicester and Leicestershire Enterprise Partnership (LLEP) and the D2N2 Enterprise Partnership (covering Derbyshire and Nottinghamshire).